Photo Hunting to Garuda Wisnu Kencana – Bali. *Air Photography Communications, PT.Sekar Menuh & XL. Outdoor Prewedding in Black & White Digital Workshop at Common Room – Bandung. *Air Photography Communications, Ceuyah Digital & Common Room. 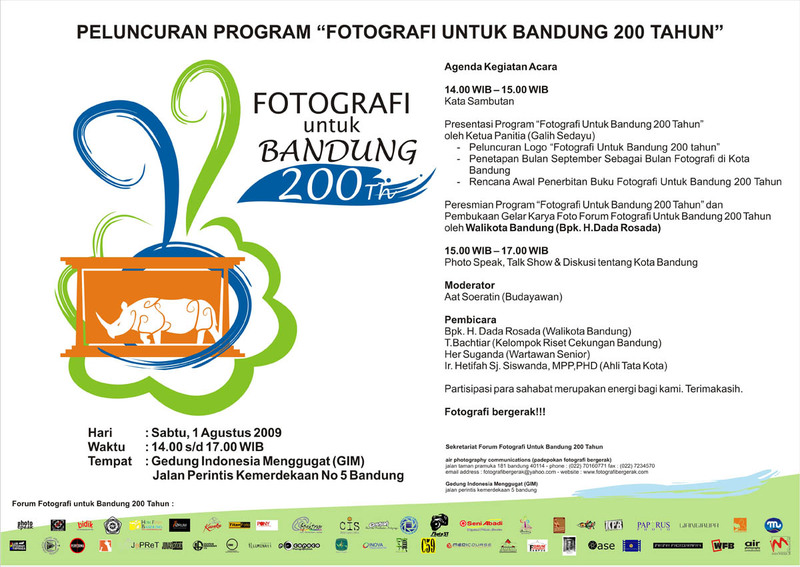 Monthly Photography Program – Bandung. *Air Photography Communications, Papyrus Photo & Ceuyah. 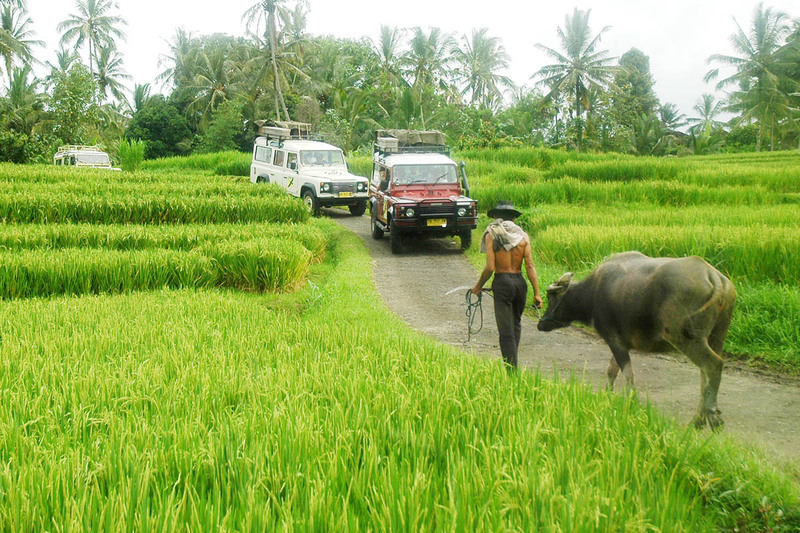 Photo Hunting to Jatiluih, Tabanan – Bali. Wedding Photography Seminar by Jerry Aurum – Bandung. *Air Photography Communications & PT Susan Album. 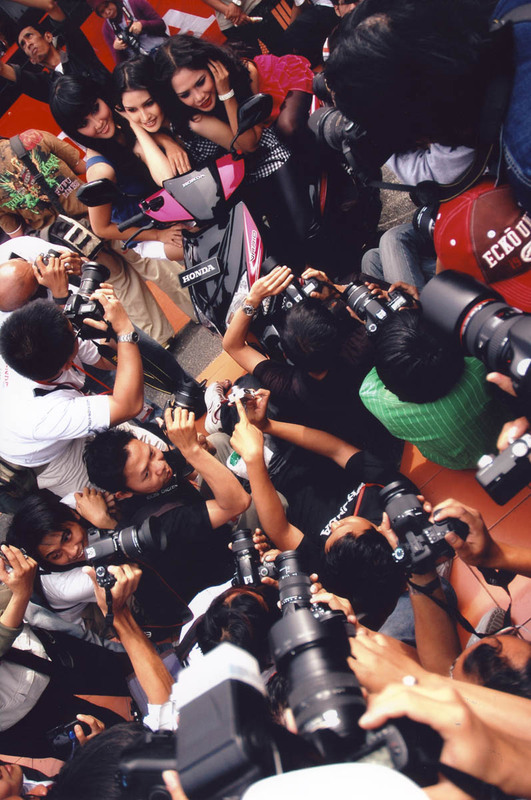 Basic & Documentary Photography Training For Public Relation of Posindo – Bandung. Basic & Documentary Photography Training For Public Relation of PT Kereta Api – Bandung. Maret 2010 : Photo Reportage at Kampung Dewata – Ciwidey. *Air Photography Communications & PJTV. Photo Story Workshop at Gelar Batik Jawa Barat. *Air Photography Communications & Republic of Entertainment. Photo Story Workshop at Gedung AACC Jl Braga. *Air Photography Communications & Bandung Creative City Forum. *Air Photography Communications & Arena Kultural. *Air Photography Communications, Republic of Entertainment & Arena Kultural. 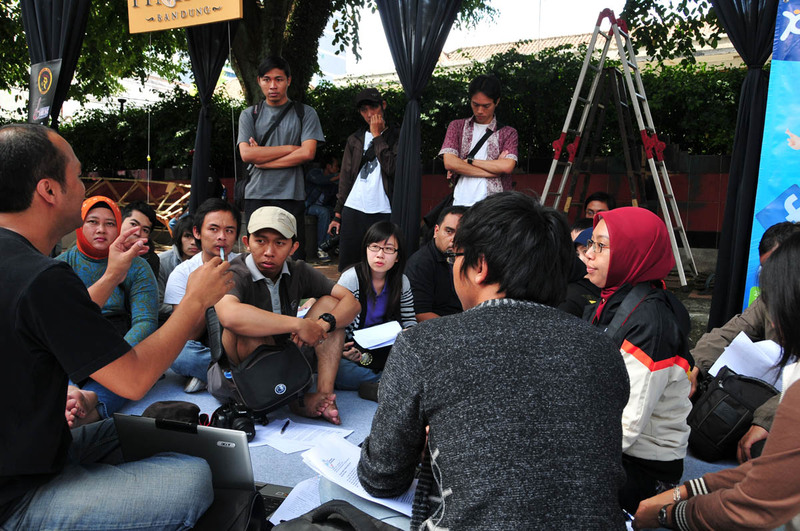 Discussion Talk, Portfolio Reviews & Story Behind The Shoot – Bandung. *Rocked & Rolled By Air Photography Communications. 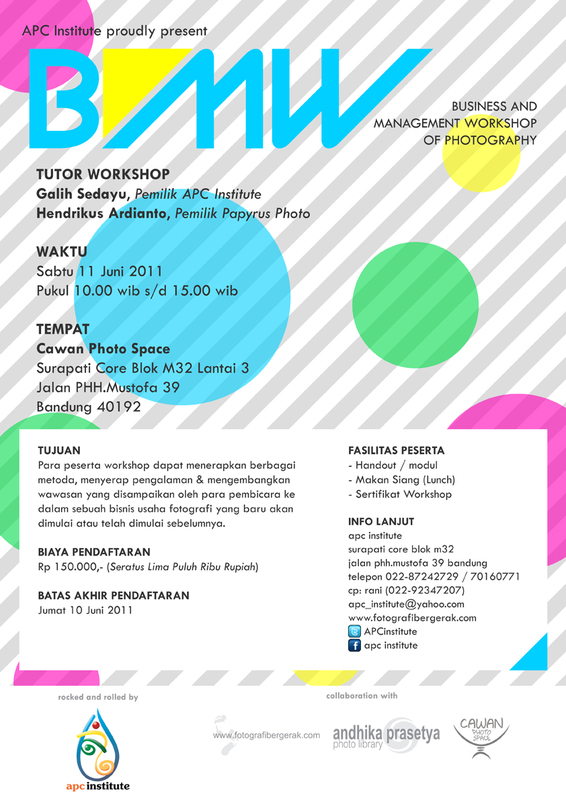 Photo Workshop, Photo Presentation, Photo Screening & Photo Talk Show – Bandung. *Air Photography Communications, Republic of Entertainment & Sabuga. 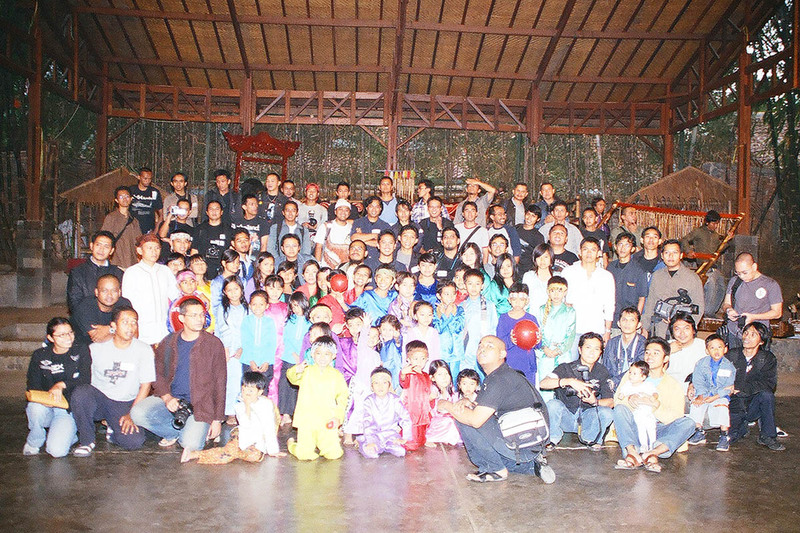 Photo Hunting & Dinner with Photographer at Saung Angklung Udjo – Bandung. *Air Photography Communications, Ceuyah, KPB, PAF, WFB & FDWB. 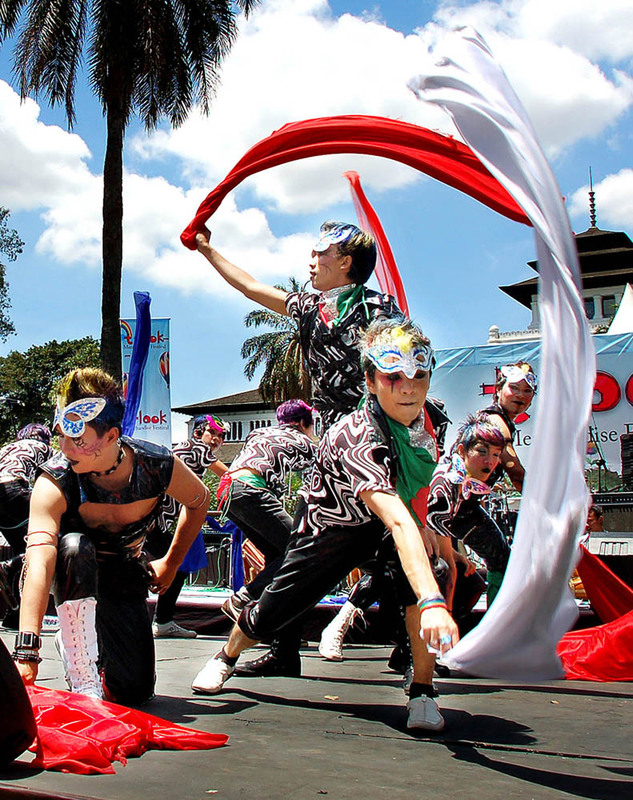 in Braga Festival at PWI Hall – Bandung. *Air Photography Communications, Disbudpar Jawa Barat, Pikiran Rakyat. 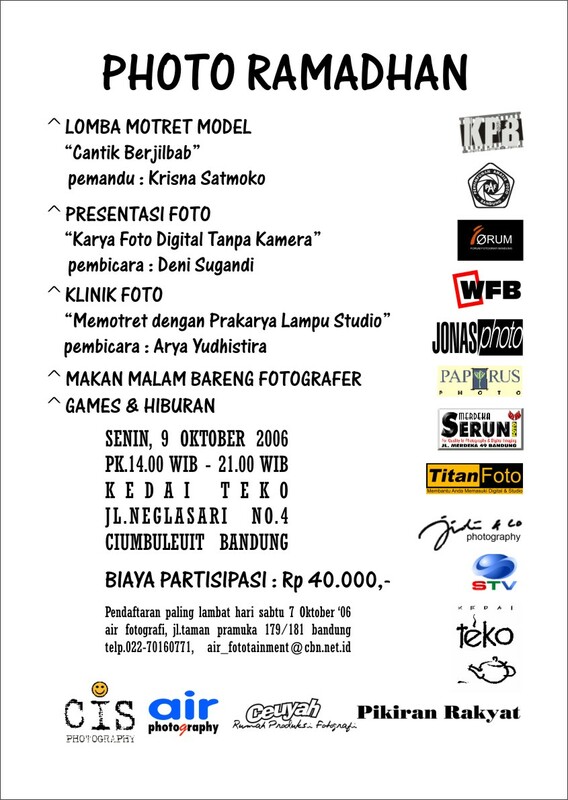 Photography Workshop, Photo Bazaar, & Photo Contest at Jonas Photo – Bandung. *Air Photography Communications, Jonas Photo, KPB, PAF, Forum & WFB. 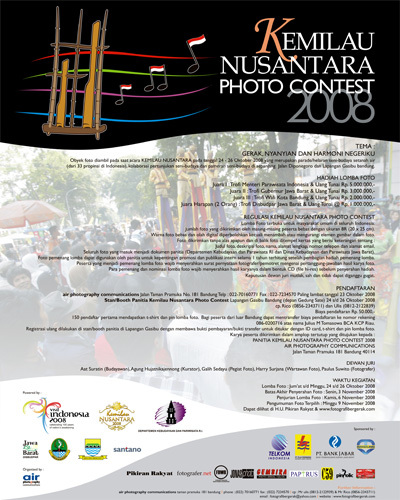 Photo Contest, Photo Clinique & Photo Hunting at Saung Angklung Udjo – Bandung. *Air Photography Communications & Lulu Album. Photo Contest, Photo Clinique & Dinner with Photographer at Kedai Teko Cafe. *Air Photography Communications, KPB & Chis Photography. Art Deco Photo Contest, photo clinique & fashion model photo contest at YPK Hall. *Air Photography Communications, Disbudpar Jawa Barat, Pikiran Rakyat & Republic. 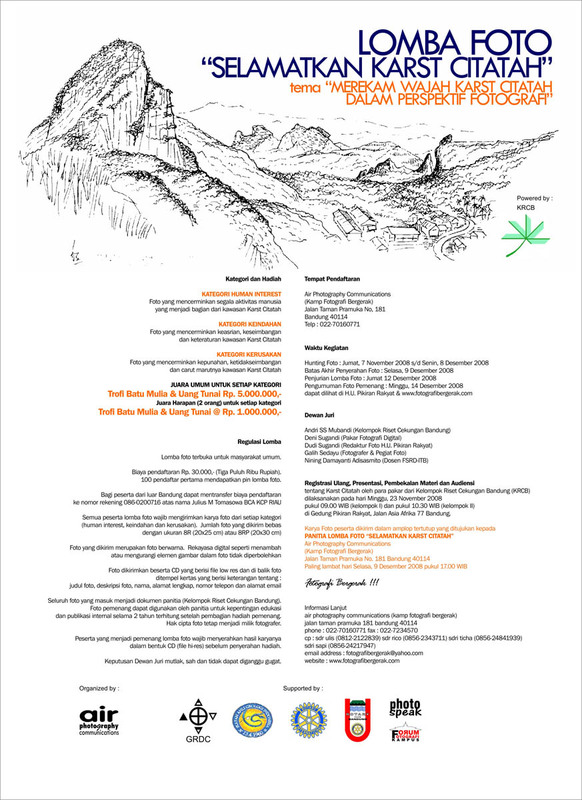 Photo Clinique,Portfolio Review & Dinner with Photographer at Swarga Cafe – Bandung. at YPK Hall – Bandung. *Air Photography Communications, Disbudpar Jawa Barat, PR & We Socialite. Photo Clinique,Portfolio Review & Dinner with Photographer at Papyrus Gallery. 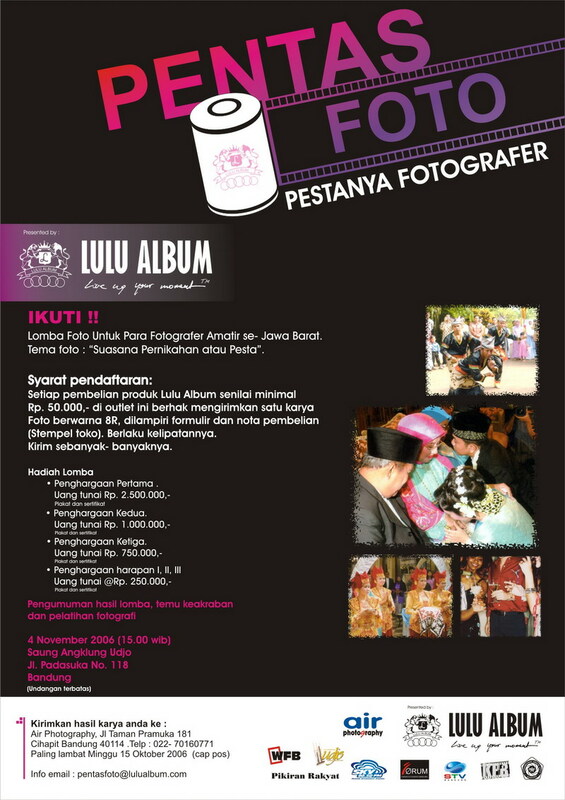 Photo exhibition,photo contest, photo speak & photo mozaic at YPK Hall – Bandung. *Air Photography Communications, Disbudpar Jawa Barat & WFB. 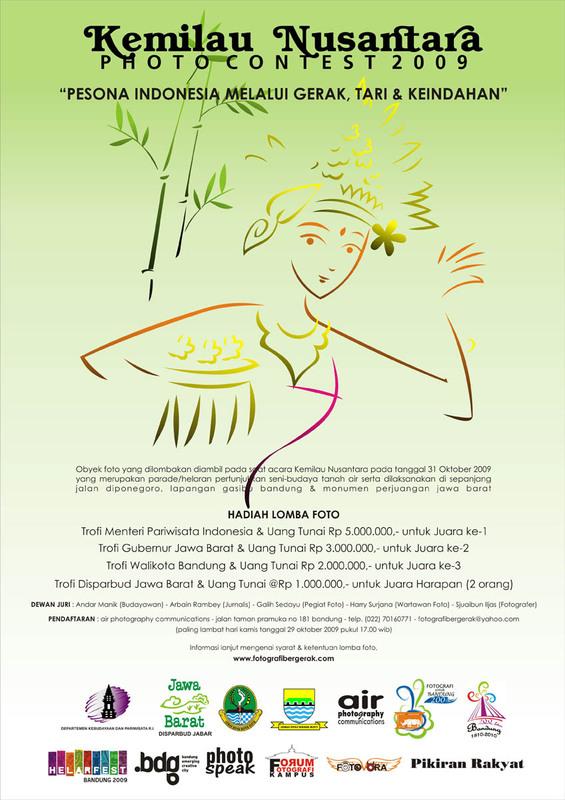 Photo contest & Photo Seminar at Saung Angklung Udjo – Bandung. 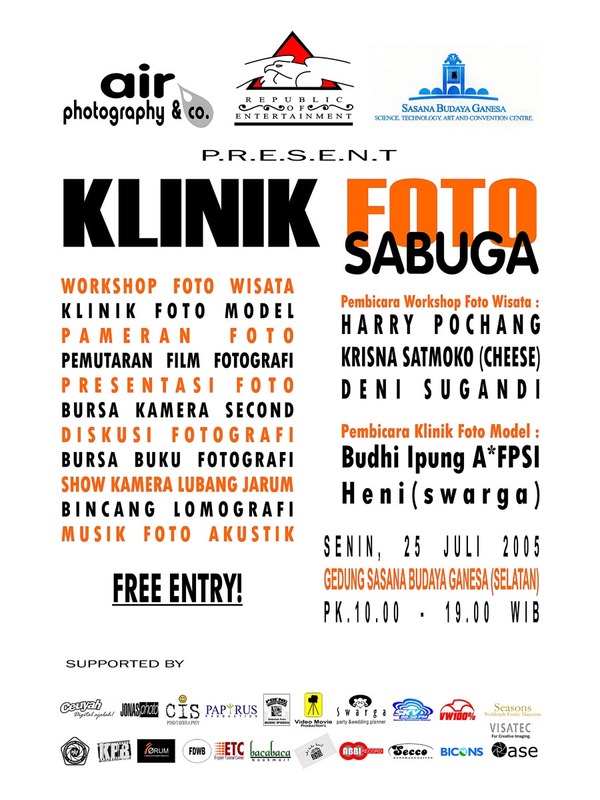 Photo exhibition, Photo Talk & Program Launching at Gedung Indonesia Menggugat – Bandung. 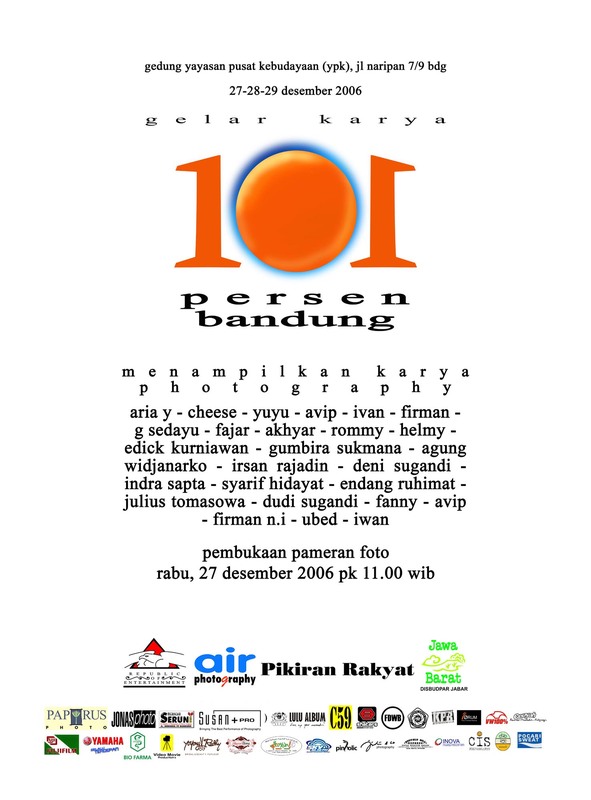 *Air Photography Communications & Forum Fotografi Untuk Bandung 200 Tahun. Photo Clinique,Portfolio Review & Dinner with Photographer at Prefere Cafe. *Air Photography Communications, Ceuyah, KPB & Prefere. 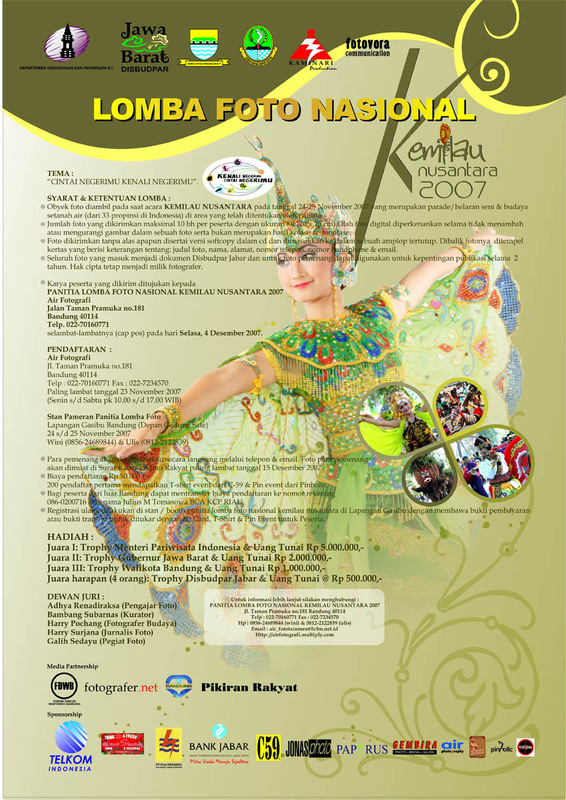 Photo Exhibition of Helarfest 2009 & Photography Walk at Cikapundung – Bandung. 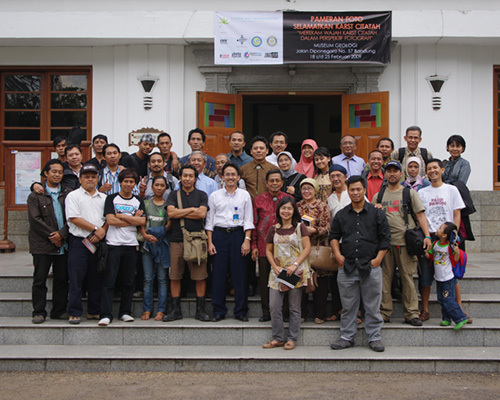 *Air Photography Communications & Bandung Creative City Forum (BCCF). 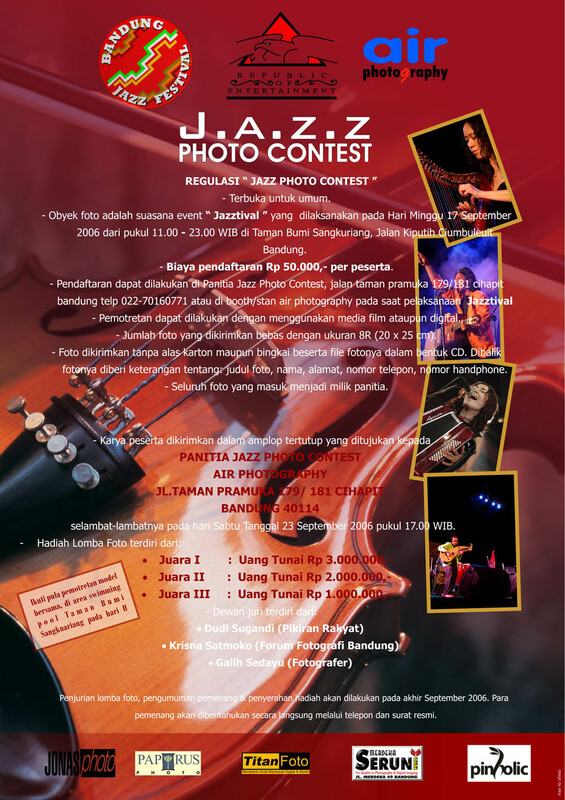 Photo exhibition, photo contest, photo speak & photo mozaic at YPK Hall – Bandung. *Air Photography Communications & Disbudpar Jawa Barat. 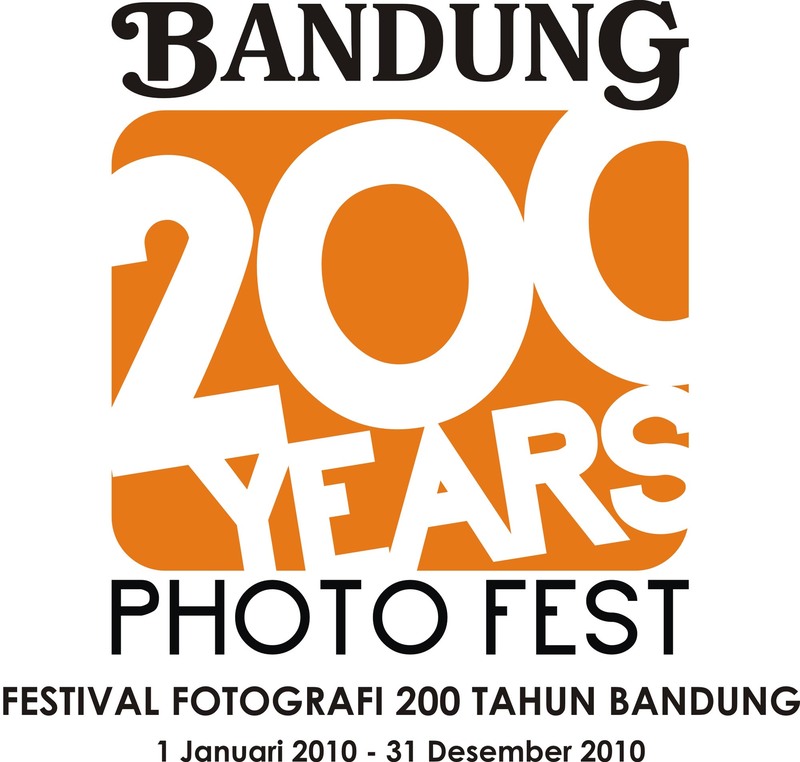 Festival fotografi 200 tahun kota bandung. 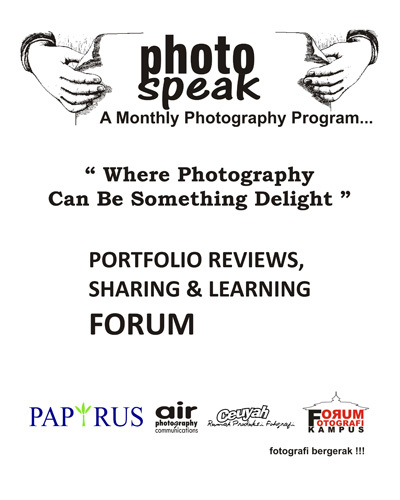 *Air Photography Communications, WFB, All Bandung Photography Community, Institution & Individual. 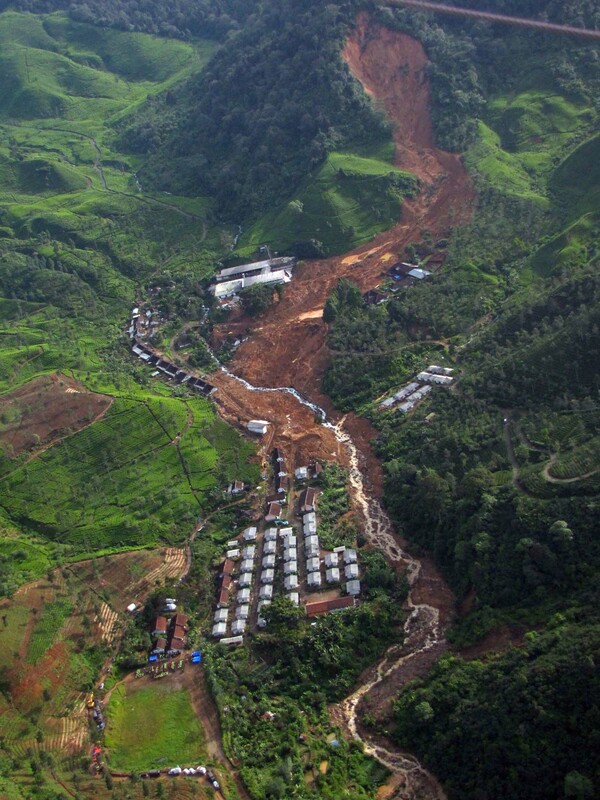 Photo Charity for Landslide Disaster of Kampung Dewata. Photography Talk about Fashion Photography by Dodi Suryanata Sukmana at Kopi Progo Cafe . *Air Photography Communications & Indosat. Photography Gathering & Ngabuburit with Photographer . Photo Reportation of Independence Day . Taking Pictures of Bandung for 24 hours . 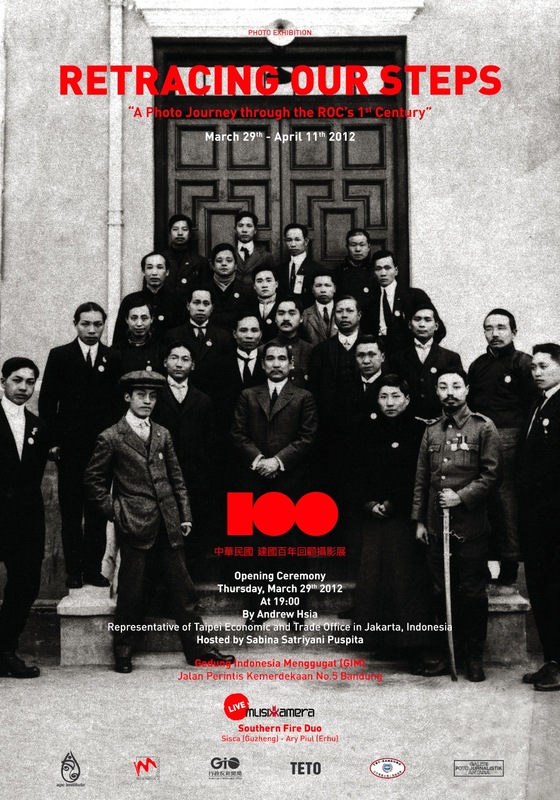 Powered by Air Foto Network & Republic of China. 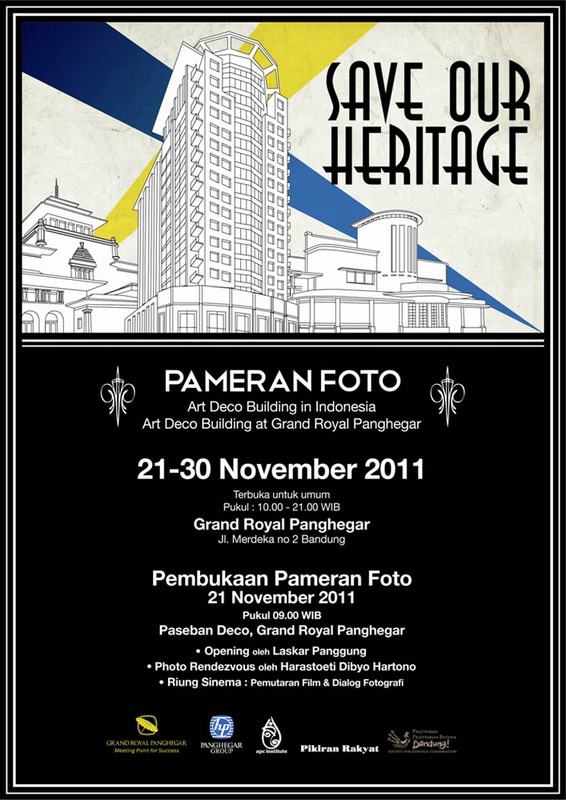 Photography Exhibition of Art Deco Building in Indonesia. 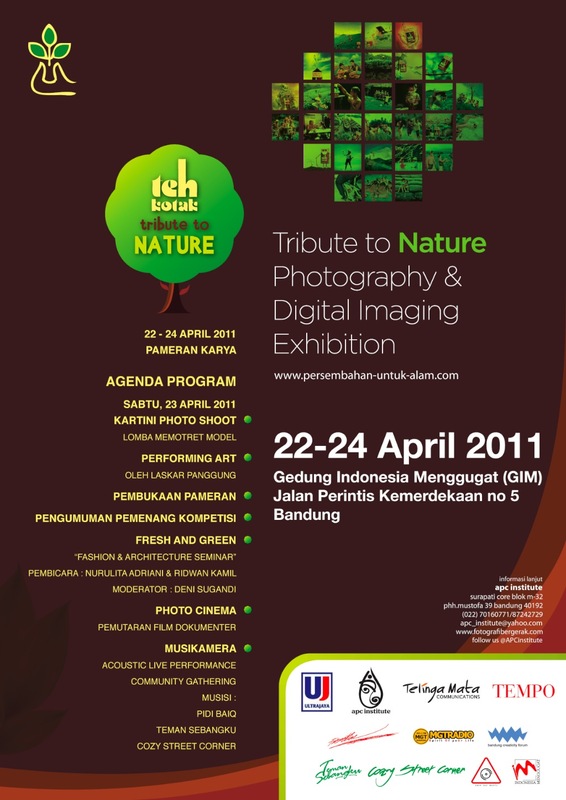 Photography & Digital Imaging Exhibition of Teh Kotak. Powered by Air Foto Network & PT Ultra Jaya, Tbk. 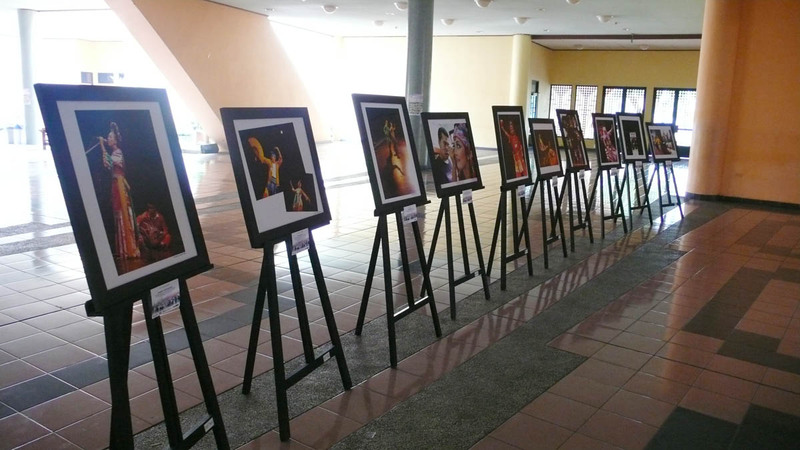 Photo Exhibition at Sasana Budaya Ganesha – Bandung. 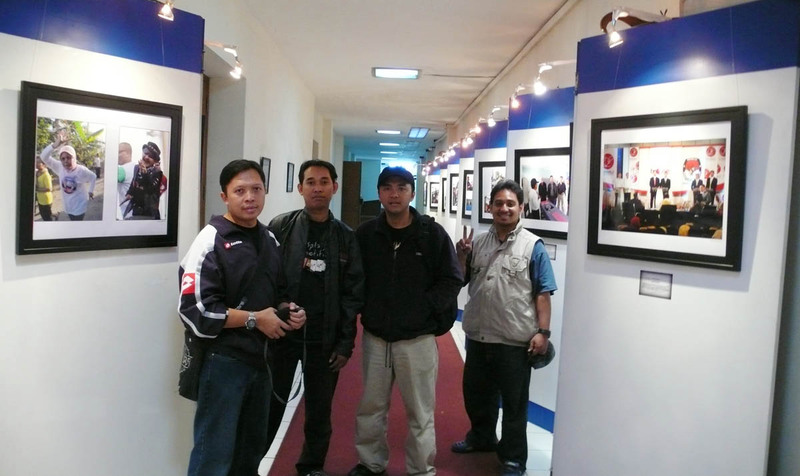 Photo Exhibition at Gedung Indonesia Menggugat – Bandung. 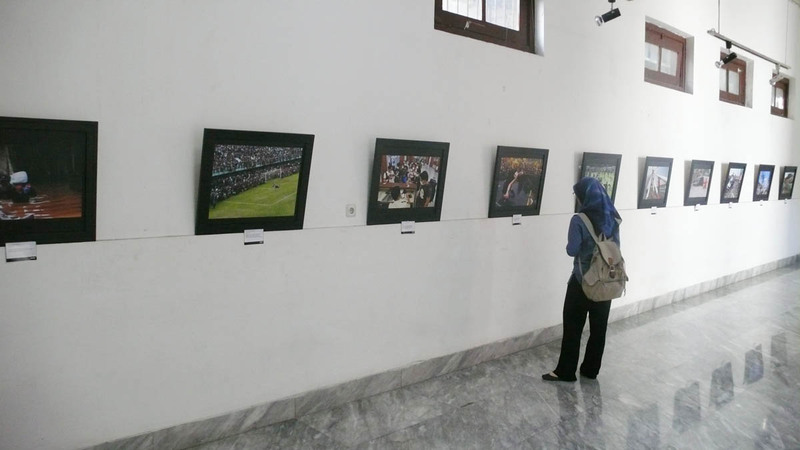 Photo Exhibition at Gedung Wahana Bhakti Pos – Bandung. Photo Exhibition at Museum Geologi – Bandung. 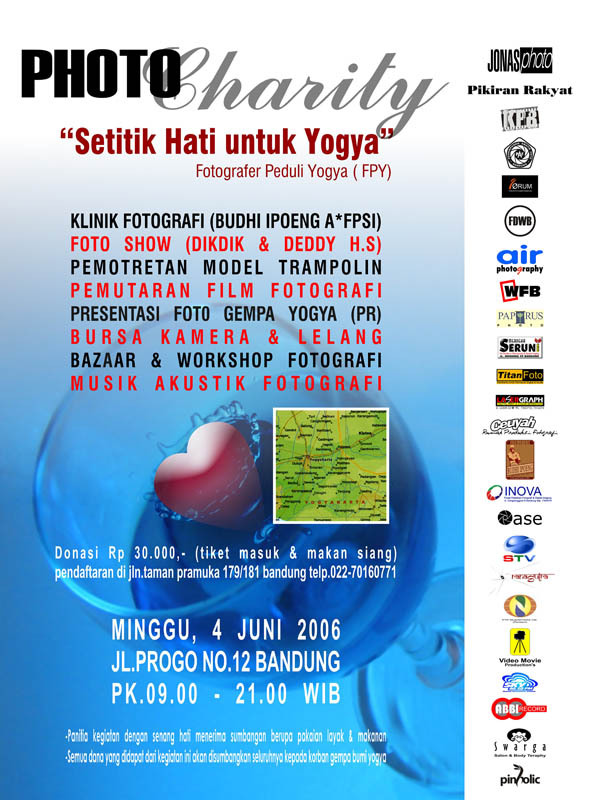 Trilogy Photo Exhibition I at YPK Hall – Bandung. Photo Exhibition of Bandung Election at Merdeka Hall – Bandung. 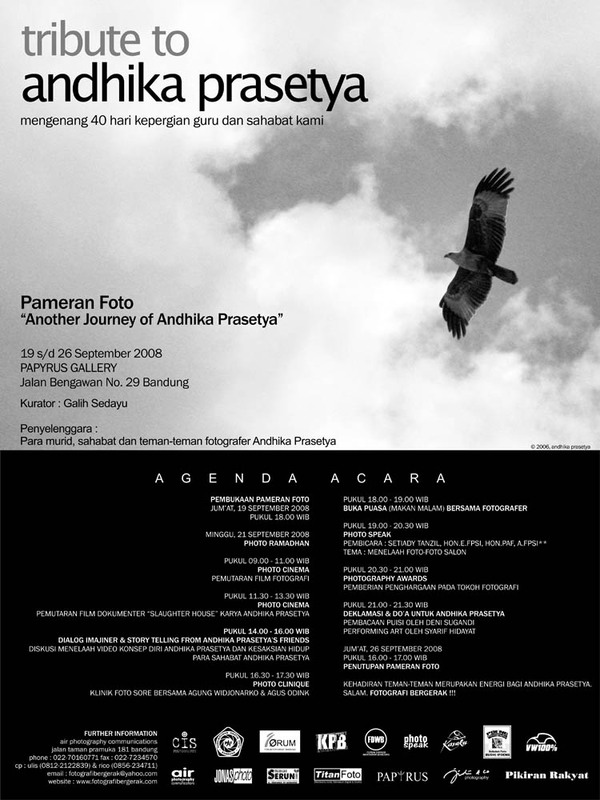 Photo Exhibition of Andhika Prasetya Memoriam at Papyrus Gallery – Bandung. 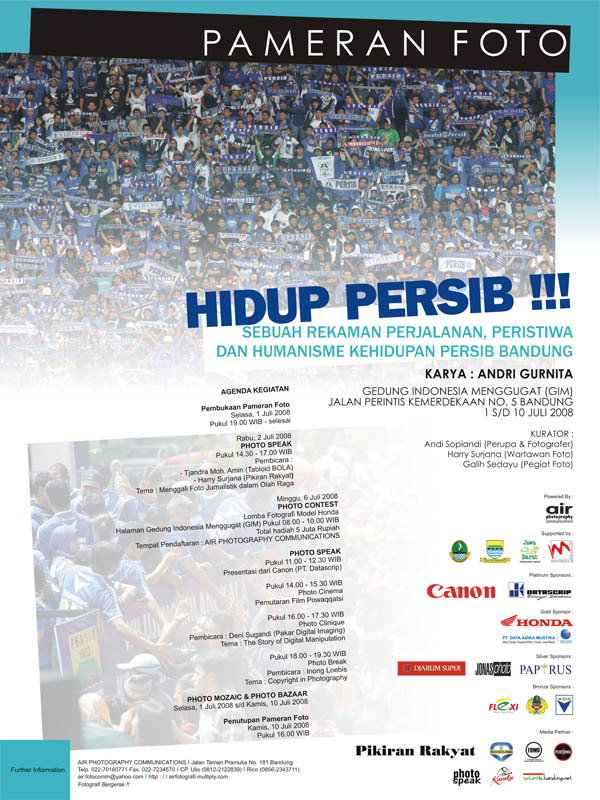 Photo Exhibition of Andri Gurnita at Gedung Indonesia Menggugat – Bandung. Photo Exhibition of West Java at YPK hall – Bandung. Photo Exhibition of Komunitas Pemotret Bandung at YPK Hall – Bandung. 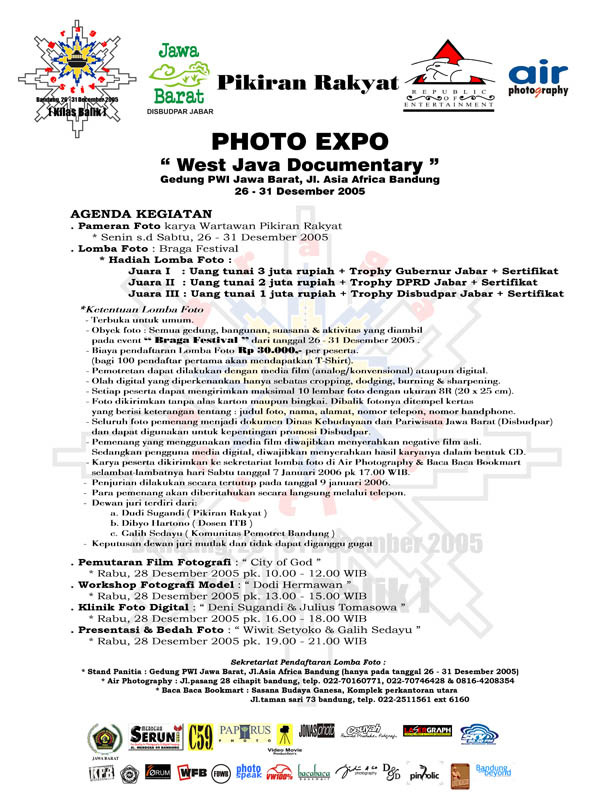 Photo Exhibition of Bandung Commercial Photographer – Bandung. 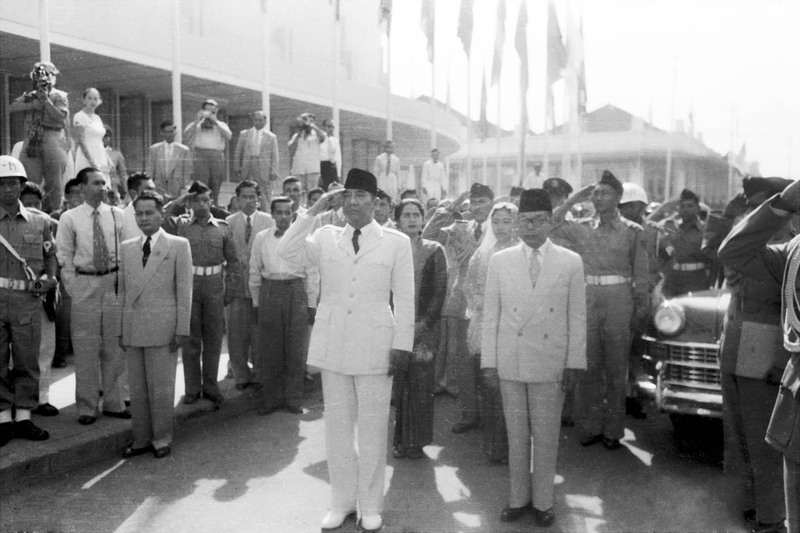 International Photo Exhibition of Asian African Summit 1955 – Bandung. 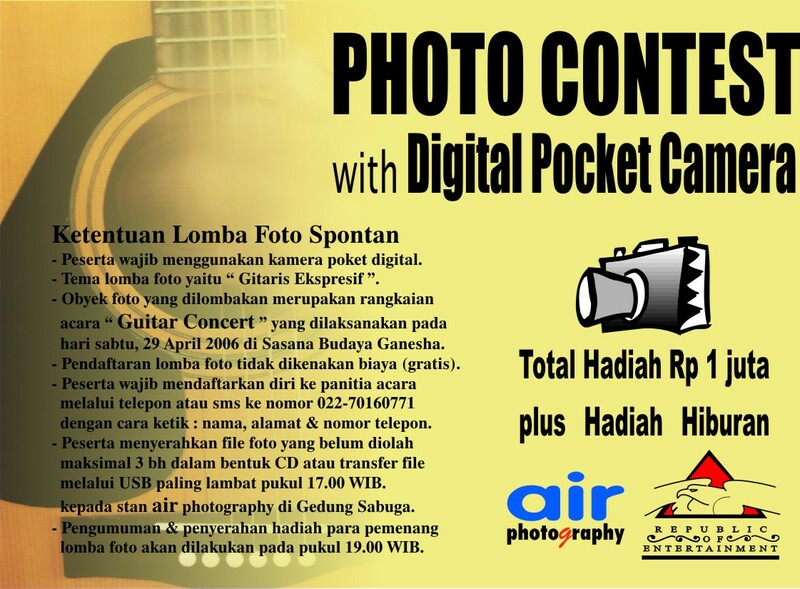 Digital Pocket Photo Contest in Guitar Concert Event at Sabuga – Bandung. 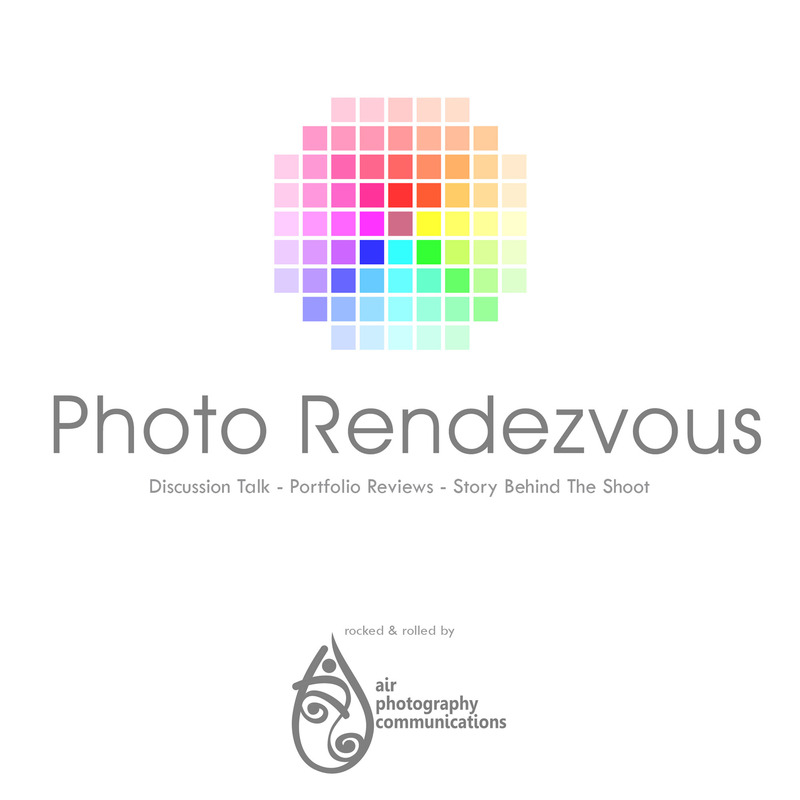 *Air Photography Communications & PT. Pos Indonesia. Photo Contest of Belia Look Model 2006 at 18th Park – Bandung. *Air Photography Communications, Nikon, Pikiran Rakyat & Belia. at Komp Lanud Husein Sastranegara – Bandung. *Air Photography Communications & Bandung Volks Wagen Club. 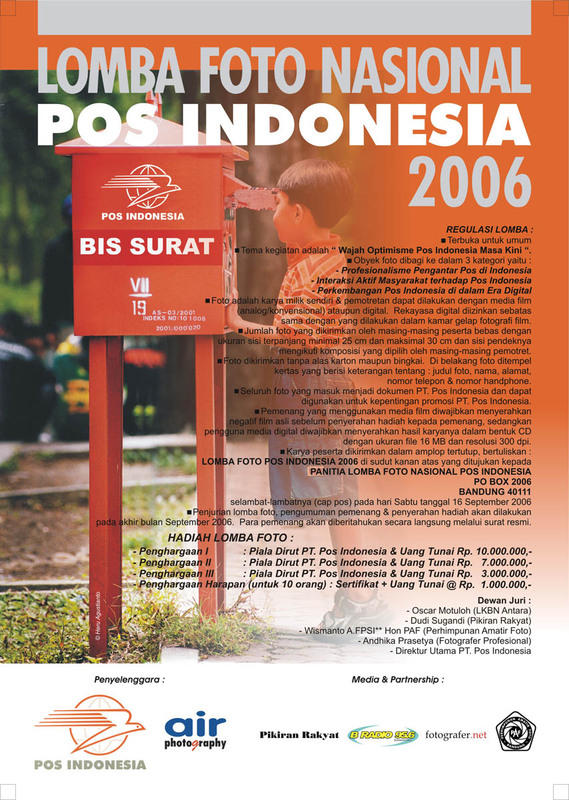 February 2007 : “ Djarum Super Friendship Day Photo Contest ” . *Air Photography Communications, Djarum Super & PAS 17. 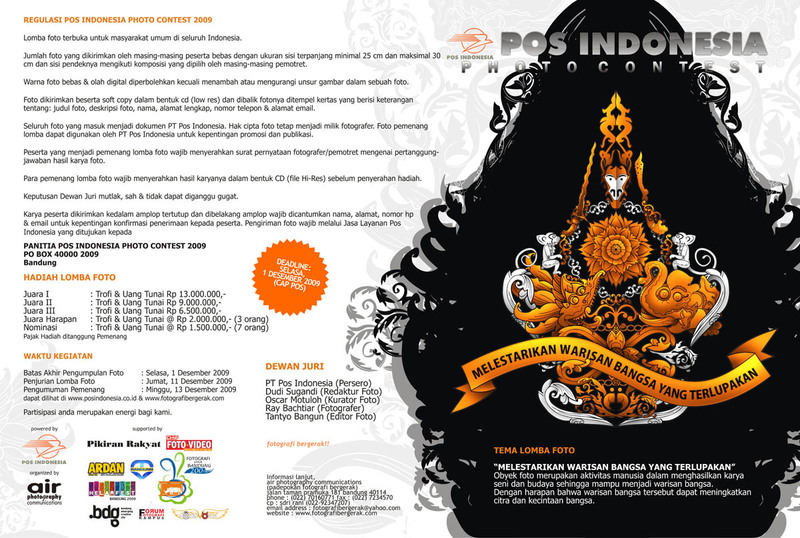 National Photo Contest with theme : Etos Kerja Orang Indonesia – Bandung. 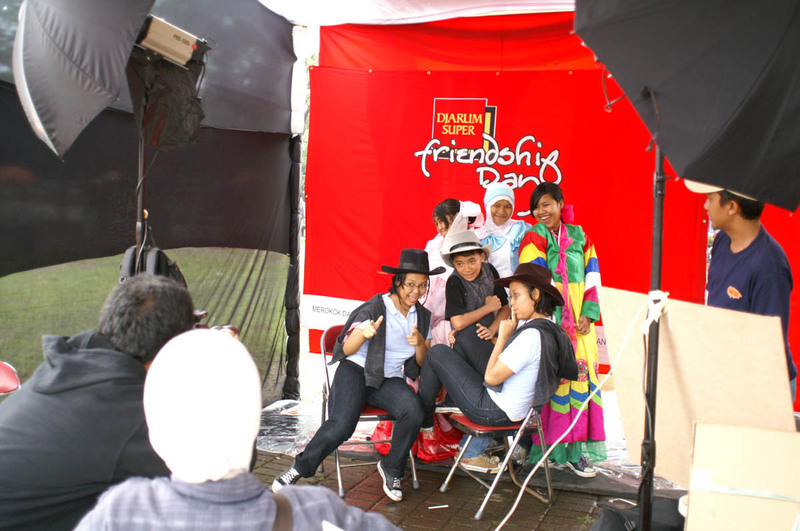 Photo Competition with theme : Friendship – Bandung. *Air Photography Communications, PT. Lulu Indonusa & Jonas Photo. 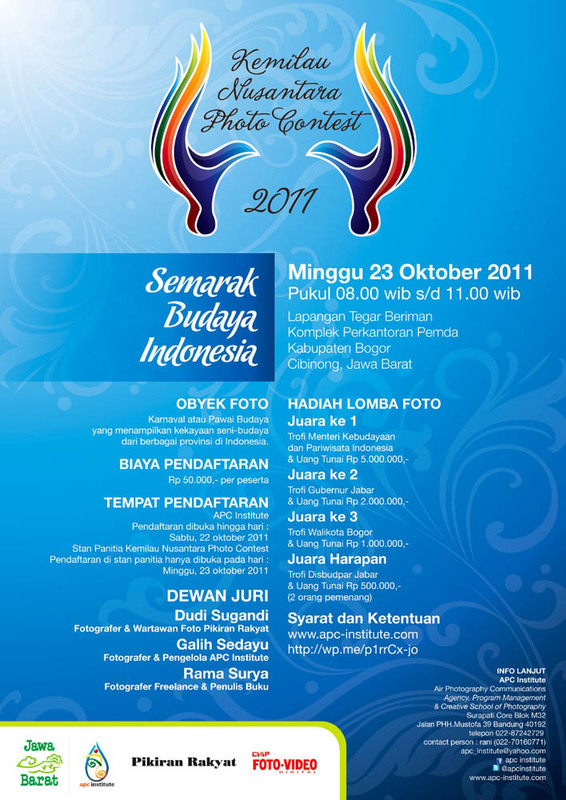 Photo Competition for Pocket Camera Community – Bandung. *Air Photography Communications, Jonas Photo & Republic of Entertainment. 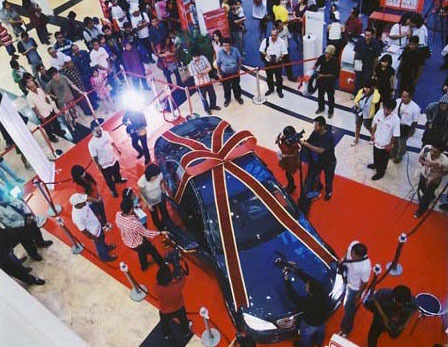 Modelling photo competition in Bandung Indah Plaza (BIP) – Bandung. *Air Photography Communications, Radio MGT & PT Arta Jasa. 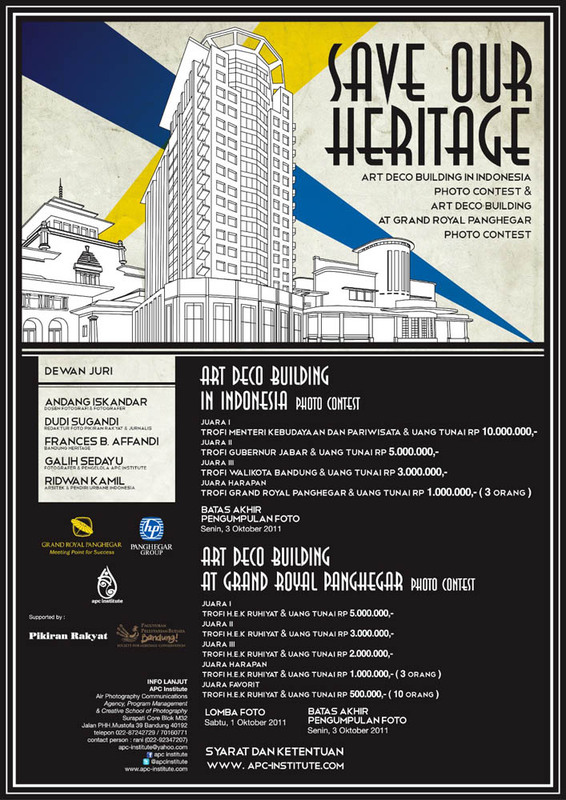 Photo Competition of Indonesian Art & Culture at Gasibu – Bandung. 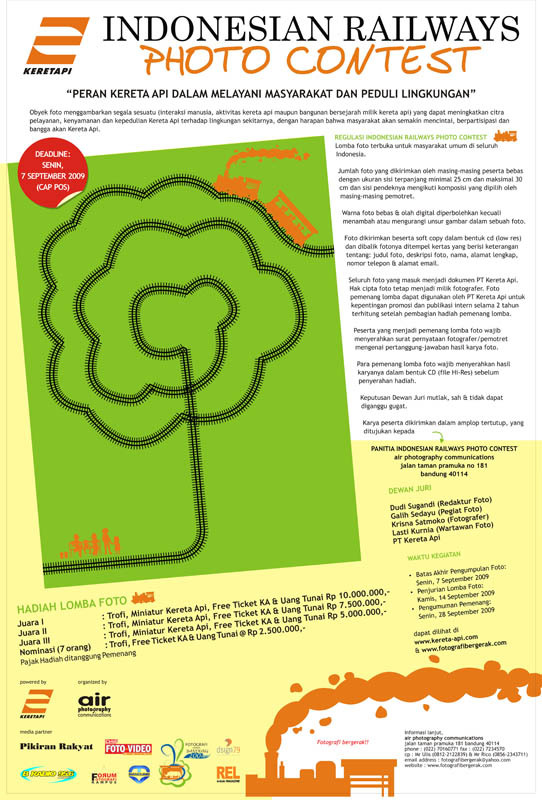 Photo Competition with theme : My Lovely City – Bandung. 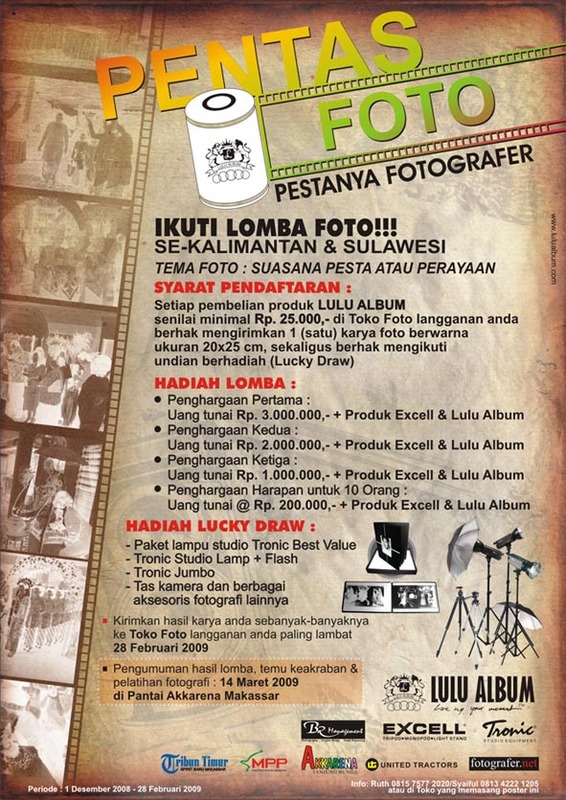 Photo Competition with theme : Merchandise Festival – Bandung. *Air Photography Communications, Republic of Entertainment & Kukmi Jabar. 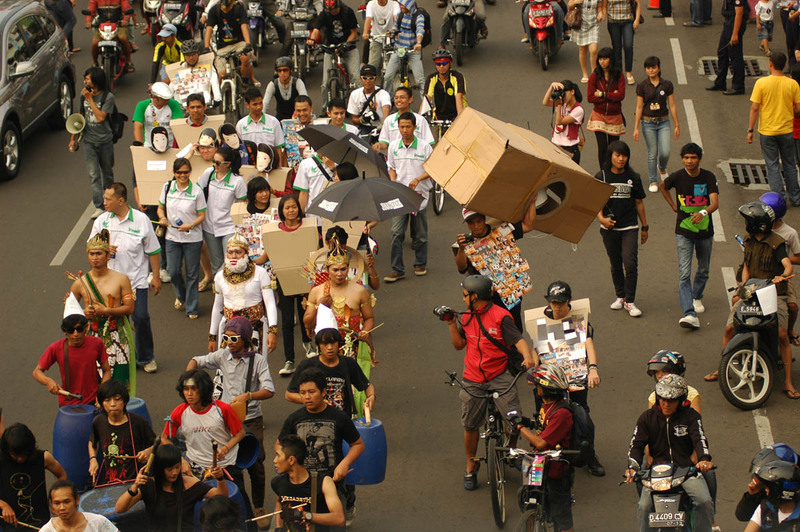 Photo Competition with theme : Power of Love – Bandung. 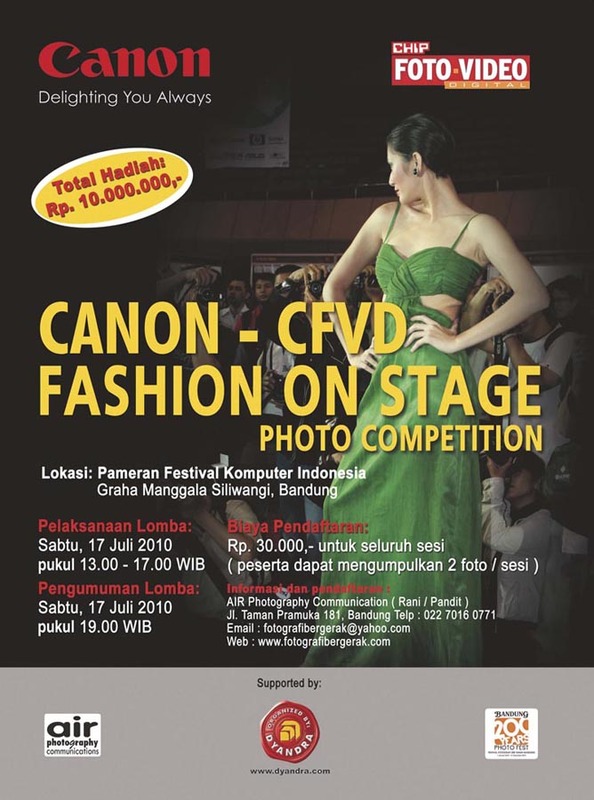 Photo Competition of Modelling at Gedung Indonesia Menggugat – Bandung. *Air Photography Communications & Honda. 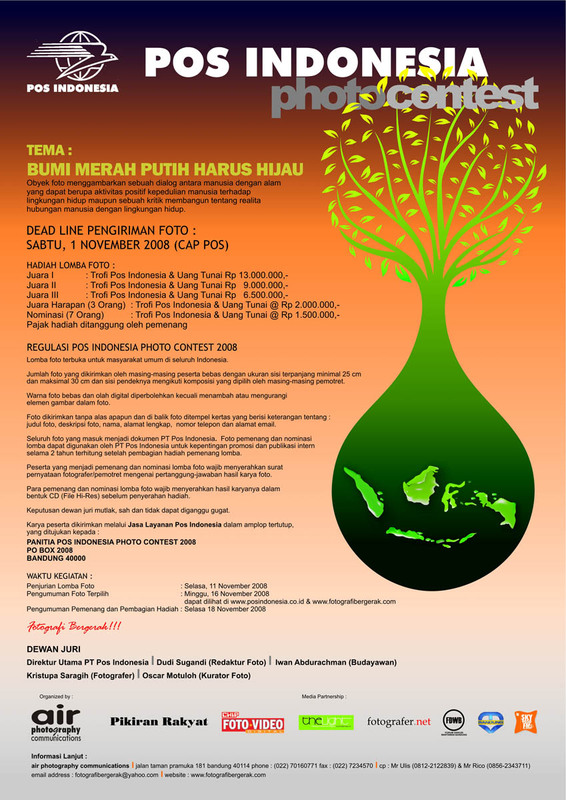 National Photo Contest with theme : Bumi Merah Putih Harus Hijau – Bandung. 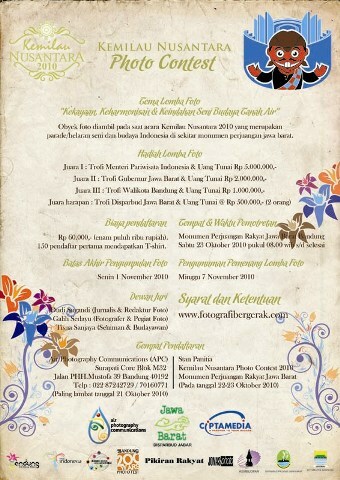 Photo Competition of Braga Festival – Bandung. *Air Photography Communications & Disbudpar Jabar. 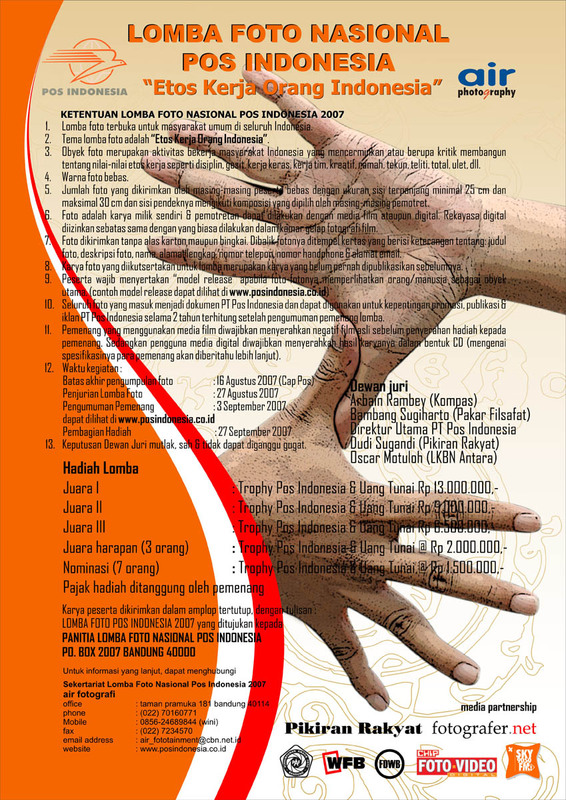 National Photo Contest with theme : Keindahan,Kerusakan & Human Interest. *Air Photography Communications & Kelompok Riset Cekungan Bandung. 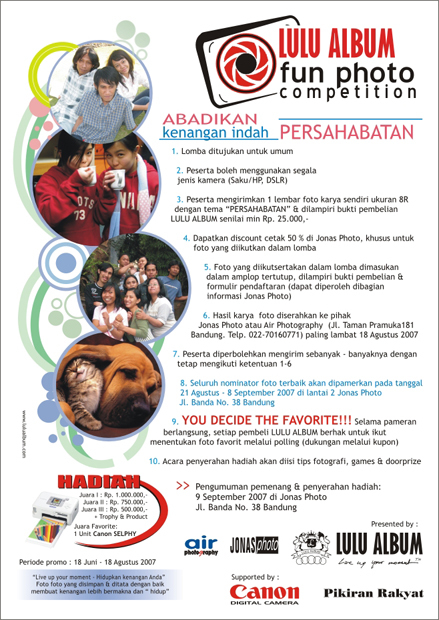 Photo Competition of Harajuku & Costplay – Bandung. *Air Photography Communications, Telkomsel & Radio Sky. *Air Photography Communications & Telkomsel. *Air Photography Communications & PT Adira Daya Mustika (Honda). 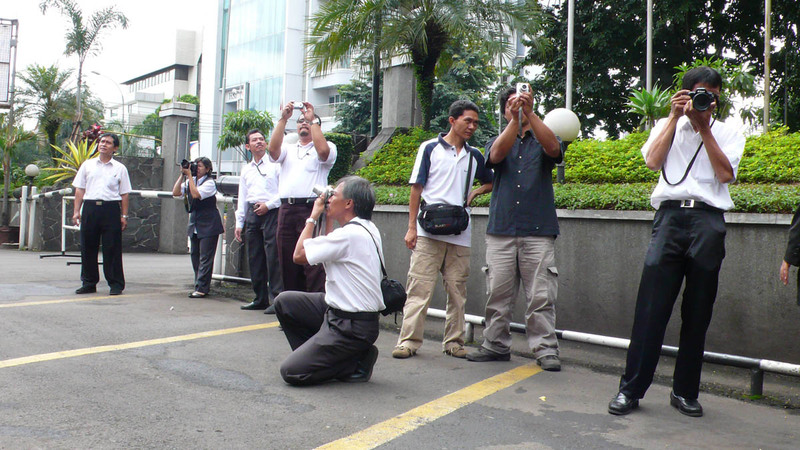 National Photo Contest of Art & Culture Parades at Monumen Perjuangan Jabar. *Air Photography Communications & Dinas Pariwisata dan Kebudayaan Jawa Barat. National Photo Contest with theme: “Peran Kereta Api Dalam Melayani Masyarakat & Peduli Lingkungan”. *Air Photography Communications & PT Kereta Api (Persero). *Air Photography Communications & VW Club Bandung. 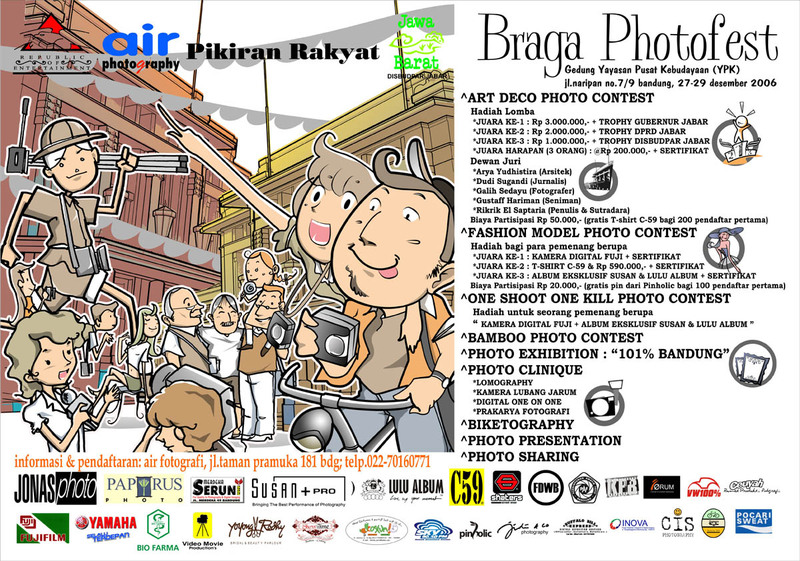 Photo Story Contest of Bragafestival Activities. *Air Photography Communications & Disparbud Jabar. 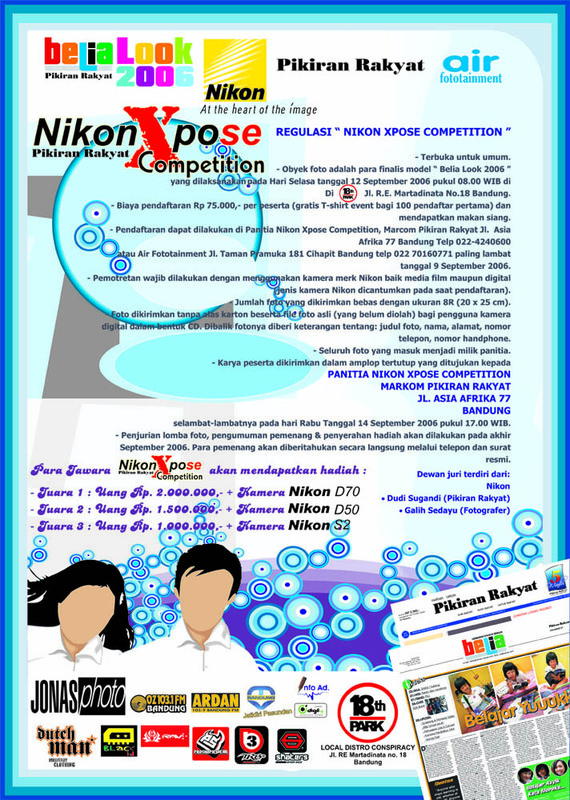 National Photo Contest with Theme: “Melestarikan Warisan Bangsa Yang Terlupakan”. 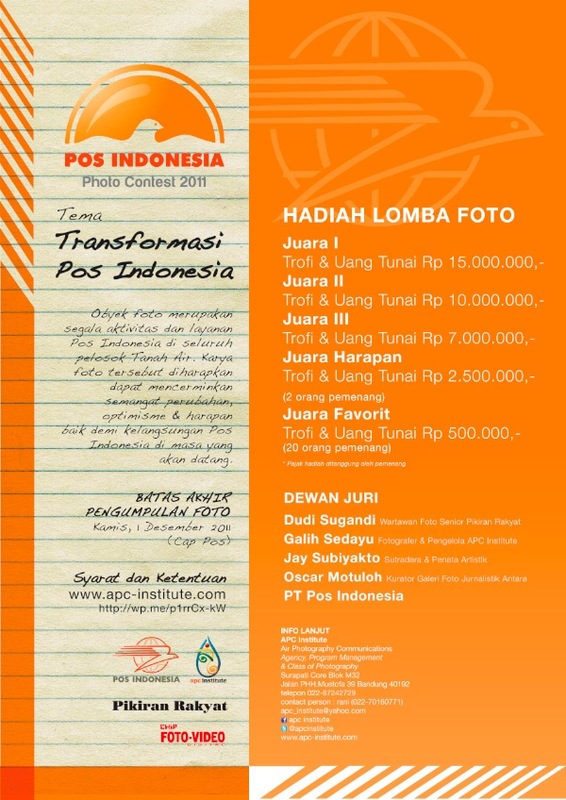 *Air Photography Communications & PT Pos Indonesia. Photo Contest of Activities & Caring to Our Parents. *Air Photography Communications, Lembaga Lansia Indonesia Jabar & Pikiran Rakyat. *Air Photography Communications & PT Daya Adira Mustika (Honda). *Air Photography Communications, Canon, CFVD & Dyandra. Photography Competition of Nyala Merdeka at Gedung Merdeka . 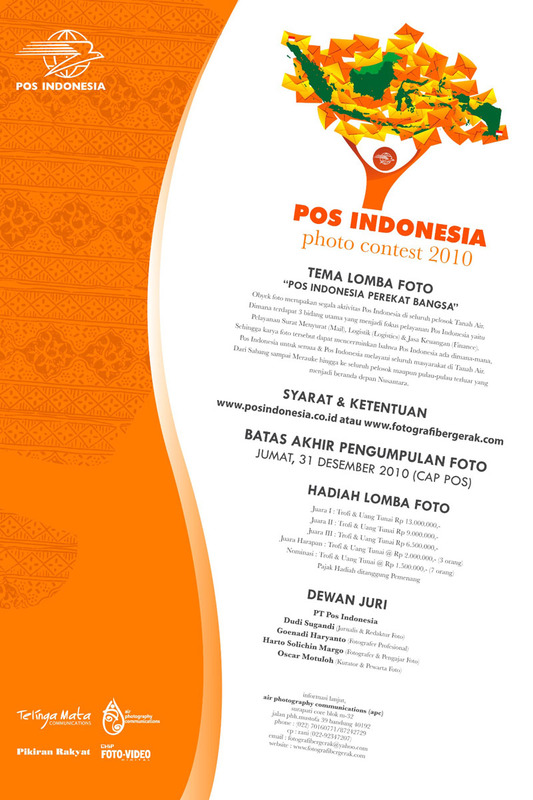 Photography Competition of Pos Indonesia Activities in Indonesia . Photo Competition of Art & Culture Festival at Monumen Perjuangan Jawa Barat . 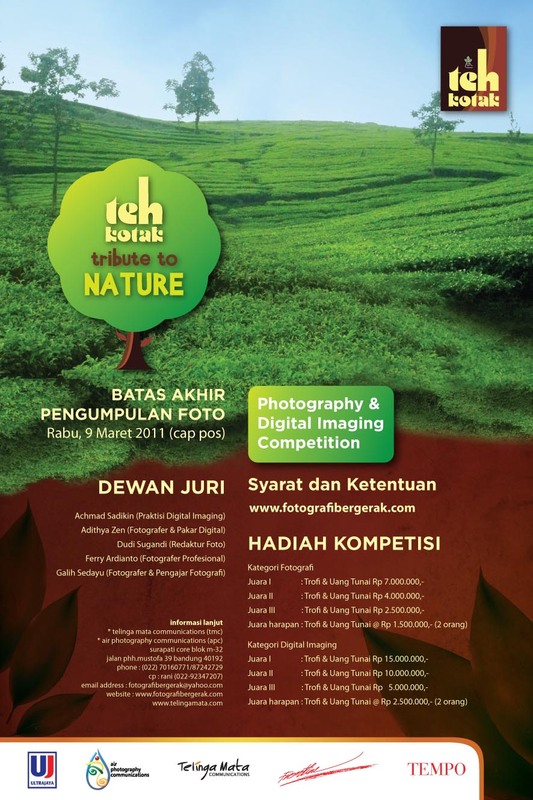 Photography & Digital Imaging Competition of Teh Kotak. *Air Photography Communications & PT Ultra Jaya.